If I do not want to post it, I will not. No need to keep trying to friend me as nothing from me is hidden on this site. Thx for understanding. 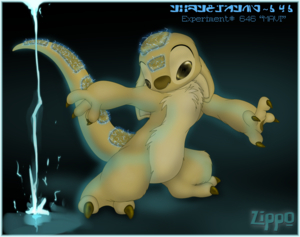 Lilo and Stitch, experiments, aliens, characters stuff goes here. Do NOT ask for commissions or for me to draw/write for/with you. Trades and/or colabs available if I offer it to you, or friends only. Do NOT edit my works. I do not charge money for my works so if you pay for it your being ripped off. ~DNP~ Please do NOT repost my works on chans/R34, they are not your works and you do NOT have my permission to repost them. If you need something to repost, take the time and effort to create it yourself. I like your Lilo & Stitch fan character! Ha! You were the only one to figure out that was Nick Wilde in my last pic!